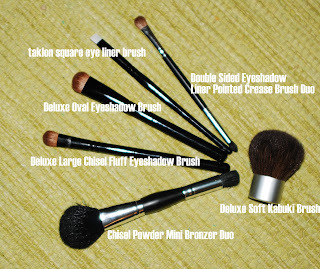 Recently, Beth from Stars Makeup Haven shared with me that she just got a new set of brushes on her site. She was also generous enough to let me try some of them out. When I first saw these brushes they reminded me of Coastal Scent brushes. However, I like the look of these brushes better. They have black ferrules and handles and remind me of A-Design brushes. Some of the Coastal Scent brushes I received seemed like their was messy stitching on the ferrule. They also didn't have the problems of strange smells when washing like some of the CS brushes. I throughly tested these brushes out by first washing and conditioning and then trying them with my makeup. After testing them, I can definitely say that these brushes are great quality for a great price. Check out my thoughts on my video! This brush is great for fluidline. It worked really well and was only $2.25. $7.95 for a kabuki? Sounds good to me. This kabuki is also very soft and had minimal shedding and no bleeding when I washed it. It works great with my pressed mineral makeup. It isn't the softest kabuki I've ever felt, but it also isn't $50-$60 like some of the others out there. For $7.95 it's pretty darn soft in its own right. Double Sided Eyeshadow Liner Pointed Crease Brush Duo! This brush is like the MAC 239 but better. I like how the bristles taper off at the edge so I can also use it as a crease blender. In the video, I used this to apply my crease color. This is just like one off the Coastal Scents site but this one seems to be constructed a little bit better. This is an essential brush for achieving the blended out crease look. Apply a little bit of highlight color and blend it down into the crease and you have the perfect gradient effect of eyeshadow. This is another double ended brush, 2 for the price of 1. Many say this is a dupe for the Stila #24 brush but a fifth of the price. I loved using the blush side for bronzer and blush and the mini flat top to apply highlight. You can also use the flat top for concentrating your mineral makeup on blemishes or under eye circles...the small shape is perfect for it. On top of this, Stars Makeup Haven is currently having a deal where you get 15% off orders of $35 or more. Just type in the code KABUKI when you check out. In all, these are great brushes and super cheap. They're definitely worth checking out. Till next time, ciao bellas! Does Stars Makeup Haven have synthetic brushes as well? The prices are really affordable, I'll definitely check it out. Thanks for the brush review.. I'm gonna go buy some right now! wes: definitely! it's a good deal! bright colored makeup: no problem hon! by the way, I used to read your xanga page and I think you're super talented! katy: no problem, i love your hair by the way! Thanks for the review! Those are some great prices. I'll have to check it out. Currently using a mix of Lowell Cornell and Essence of Beauty brushes. yay i can't wait to get money..to get new brushes lol. Hi Ren, thanks for this lovely review! I have wondered about their brushes!!!! Hey Ren! I've been a lurker for awhile and I really Love your blog! It's definitely one of my daily checks. =)Great review they sound really great! I have to try these brushes! They look fantastic and ofcourse I am loving the price. Thanks for sharing! argh you got me lemming for some NEW brushes! hehe. Definately going to buy a few of the brushes. I was wondering if you knew when adesign was going to have their 14 brush collection available and for how much. Also, do you have any suggestions on buying a full brush set collection (good to great brushes)but without the price tag? PS I enjoy your tutorials!